I had read of Dr. R T Doshi in the late eighties. He is a retired industrialist who lives in Bandra, Mumbai and is fascinated by plants and the proper utilisation of waste biomass. What I read in the article was unbelievable. Here was a man who was using the crushed sugarcane from a nearby 'juice centre' and growing plants in open sacks. 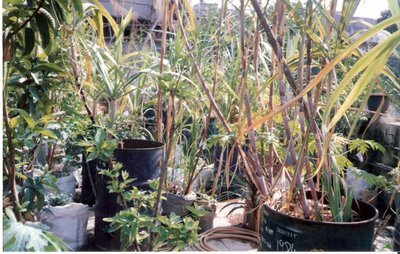 He had attained such a degree of success that his terrace was like a mini forest. 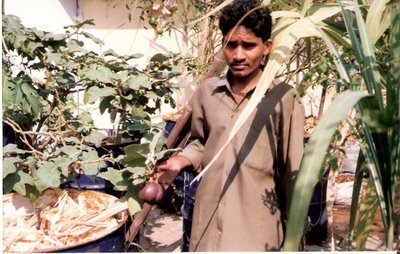 He had even succeeded in growing strawberries in the humid Mumbai climate. Some years later I read about him again and saw him in a science program named Turning Point in Doordarshan. Seeing him on television added to the fascination I had developed for him and his methods. It was unbelievable that someone could use open sacks, sugarcane and kitchen waste and get the kind of results that he had got. But those were the pre-internet days and I could not follow up on my fascination which had bordered on obsession. Sometime during the late nineties I read about Prof Dabholkar of Kolhapur and his Prayog Parivar and his unique method of teaching students using the humble postcard. It was also fascinating that someone who had taught mathematics for many years could become an expert on plants and was able to communicate with unlettered peasants and farmers - something many of our agricultural scientists just could not do. I will need another blogpost to do justice to Prof Dabholkar and his family of experimenters. I also came to know about a book titled Plenty For All written by Prof Dabholkar in which he wrote about his work and his philosophy. His simple ideas of harnessing the power of the sun and of biomass would appeal to anyone who liked a common sense approach to things. Through this book I was able to again read about Dr Doshi and I came to know that he was associated with Prof Dabholkar. I also came to know about a booklet named City Farming which was written by Dr Doshi. I ordered a copy for myself. 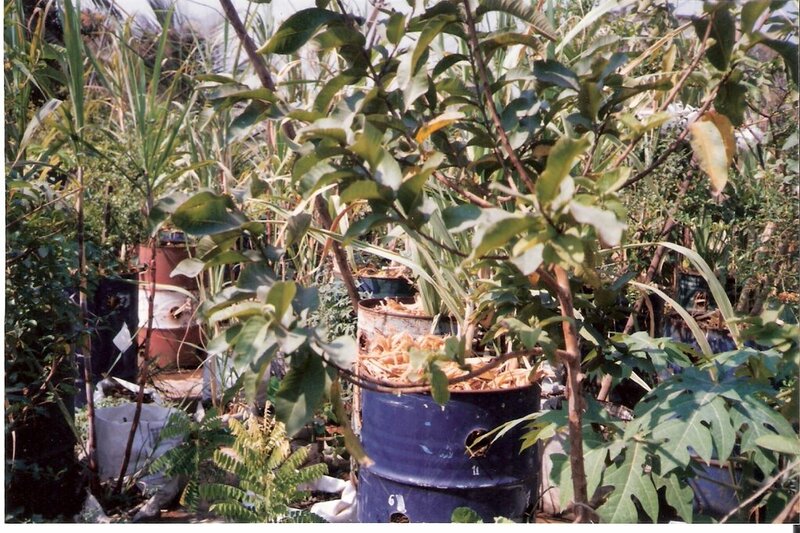 In this booklet Dr Doshi explains his method of city farming in which he uses biomass especially crushed sugarcane and very little soil to do wonders. To cut a long story short I rang up Dr Doshi and he was kind enough to invite me over to take a look at his city farm. I booked a seat on an Indore Mumbai bus and on a cold winter evening on a Saturday in January 1999 I took a bus ride to Mumbai. Mumbai was warm when I arrived there. Dr Doshi's house "Jamunotry" on the 26th Road Bandra was easy to find. I was welcomed very warmly by Dr Doshi and his family. I also saw a wide spectrum of visitors from different areas of specialisation who had come to see his garden. I was asked to get ready and return. After a bath and breakfast l was taken up to the terrace by Dr Doshi and his assistant. It was an awesome sight. 1200 square feet of greenery on a rooftop. This included a coconut tree with fruit. Dr Doshi had also started experimenting with growing plants in drums and it was fascinating to see plants sprouting out of the sides of huge 200 litre drums. Each drum was dedicated to the kitchen waste from a neighbouring family and with the help of crushed sugarcane the Doshi family had converted their terrace into a mini farm. He called this community farming. The bus ride back to Mhow was thrilling for the simple reason that I was infected with the enthusiasm that Dr Doshi had in him. 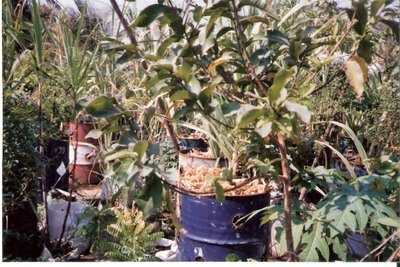 Over the years I have experimented on a modest scale with growing plants using waste biomass and kitchen waste and have attained a fair degree of success. I also remember reading a talk by the Vietnamese Buddhist Monk Thich Nhat Hanh in which he compares the composting process of biomass with the composting process in our hearts and minds. Thich Nhat Hanh talks of conerting garbage to flowers and he says that we can do the same thing with our negative emotions. They are the garbage which life gives us and if we can compost them properly we can grow flowers of a different nature there. I had got these lines printed using a word processor and presented a copy each to Prof Dabholkar and to Dr Doshi. In memory of that fantastic day and the fantastic work done by Dr Doshi here are a few photographs of his city farm. Below: A coconut tree on the terrace. 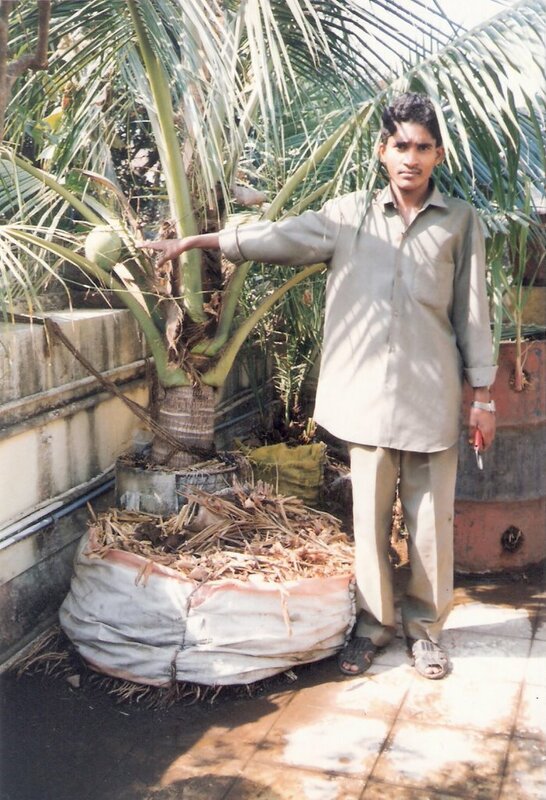 Dr Doshi's farm assistant is standing besides it. Below: Tasty brinjals growing out of a drum. Below: A date palm (khajoor) which one would normally see in a dry and arid area. 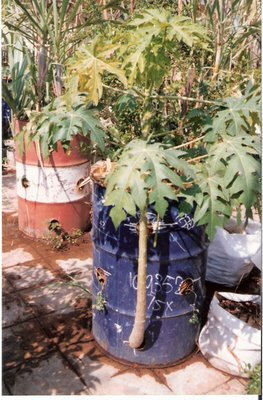 Below: A Papaya (papita) grows out of a drum. 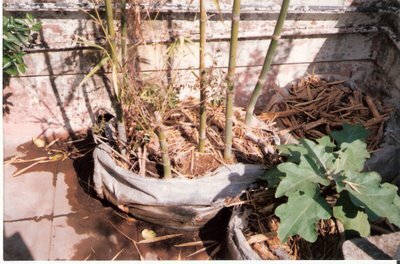 Below: Bamboo growing in one corner of the terrace. Below: I am not sure which plant this is. I would guess it is a chikoo. Just look at the richness. I have read newspaper articles about many others in Mumbai and Pune who are trying this method and have attained varying degrees of success. But whenever I hear or read about such terrace/city farms my mind goes back to that sunday I spent in Bandra enjoying the sight of what Dr Doshi and his team had created through sheer hard work and scientific insight. Dr Doshi has been awarded the Padma Shri for his pioneering efforts in this area. such farm which can make them not having to depend on their financial earning to feed the family. If it can be done how mach on approximate minimum land necessary to feed the family of size say 10. That was a nice article. May I know the contact no of Mr Doshi. Im from Bangalore and keen on learning this method of terrace cultivation. 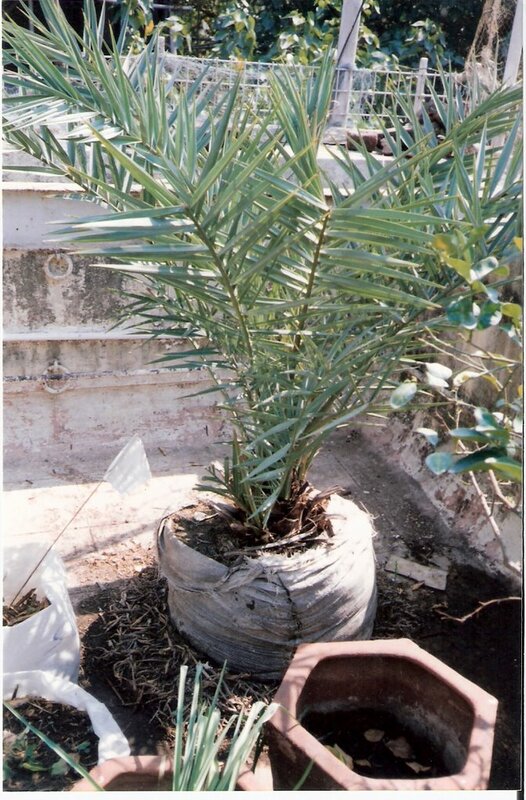 Can you briefly tell the procedure of planting from the booklet named City Farming which was written by Dr Doshi. 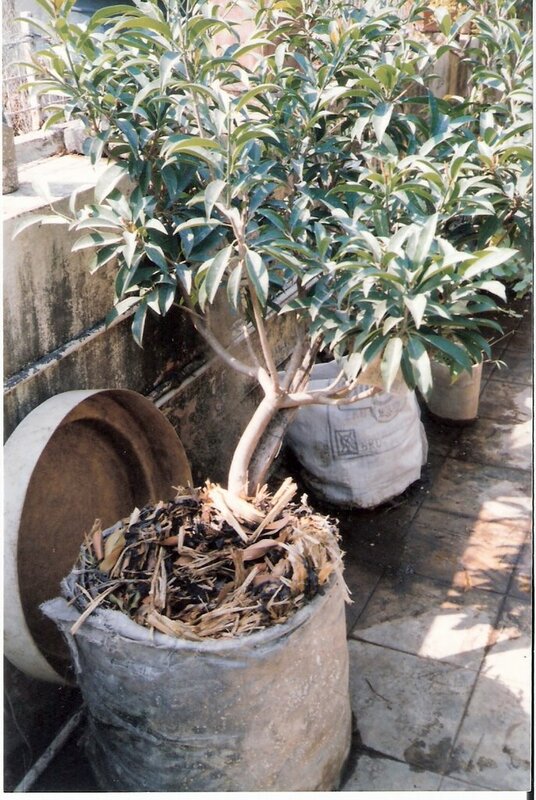 Can I have more details to be able to plant atleast one plant using process used by Dr Doshi? hi is it possible to get a phone number for mr. doshi? could you please mail it at faiza15@yahoo.com? thanks. i was wondering if i could have Dr. Doshi's address and phone number. wanted to visit the place with 6 of my students. Please send me Dr Doshi's Contact details and address. Accidentally happened to see Dr Doshi's site in Google and was amazed to see his efforts in promoting Garden in his Roof. 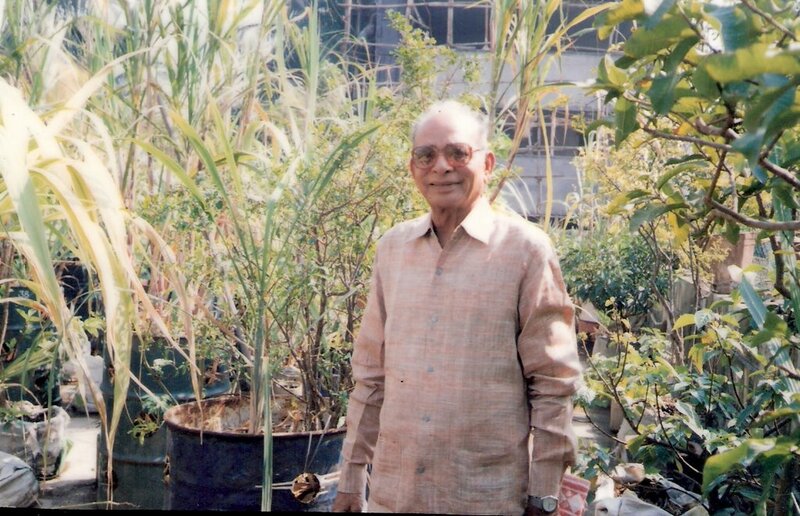 I am 80 yrs and started taking interest in garening abut 4 years ago and have a Roof Garden with Flowers and Vegetables. I have around 200 SFT of roof and have around 120 pots of different sizes. I am happy to go through the details of Dr Doshi's site. Thanks. -- rkrajagopalan. Thanks for sharing this to us, your blog is really great we can learn something to it. Very impressive, love this post! keep up! I too need Mr Doshi's contact number to visit his garden. Hi! Amazing blog. Its a treat to read your blog. Please can you share Dr Doshi s contact number. I would like to meet him. Dr Rupal Shah. I live in Mhow - a small cantonment town (as Army garrison towns in India are known)in Central India. My father settled here after retiring from the Indian Army. He had served from 1943 to 1980. I have spent my childhood in Shillong(Assam), Mavelikara (Kerala), Delhi, Mhow (MP), Alwar (Rajasthan), Shillong (Meghalaya) and Mhow (MP) - in that order. I have worked as a software programmer from 1985 to 1989. Am working with children now and am also a freelance writer. Interests include films, books, music, blogging, cycling, nature walks.